Customer comment tools provide financial institutions a valuable tool to identify and reply to customers who have had a negative service experience and may be at risk for attrition or spreading negative word of mouth. 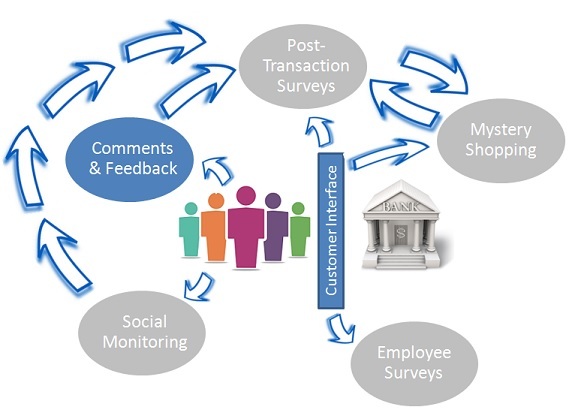 Beyond randomly surveying customers who have recently conducted a service interaction at a branch or call center, banks should also provide an avenue for self-selected customer feedback, feedback from customers who have not been selected to participate in a survey, but want to comment on the experience. In the past, this vehicle for collecting this unsolicited feedback would be the good old fashioned comment card. Today, the Internet offers a much more efficient means of collecting this feedback. For the branch channel, invitations to provide feedback with a URL to an online comment form can be printed on transaction receipts. For call centers, customers can be directed to IVR systems to capture voice feedback from customers. Website and mobile users can be offered online comment forms as well. Notice the operative word in the first three categories: extreme. If a customer is satisfied with the product or service, why bother to give feedback? Customers expect to be satisfied. Having your expectations met is not something to write about. In research parlance, the sample is self-selected, and the people who provide such feedback are not likely to be representative of the general population of customers. It therefore makes no sense to ask these people to provide ratings that are going to be tabulated and averaged. The results will be useless at best and completely misleading at worst. Here is something I would like you to know . . .
Additionally, the check box can be included asking the customer if they would like someone to contact them as a result of their feedback. This type of feedback tool will deliver valuable qualitative data about the experience that prompted the customer to provide the feedback. It is essential that a system for analyzing and responding to the feedback be put into place. First, sort the comments according to if the customer wants a reply to their feedback. There are ways to streamline this process, but to ignore it is to make matters worse, because customers (the angry ones, at least) will expect a reply. On the other hand, responding to customer concerns makes comment tools exceptionally valuable. First, they provide a method to identify and reply to customers who have had a negative service experience and may be at risk for attrition or undermine the brand with negative word of mouth, and even worse social media commentary. Second, they Minimize negative word-of-mouth advertising that would undermine marketing efforts; and increase positive word-of-mouth advertising (customers who have had a problem fixed are famous for becoming vocal advocates of a company). The flip-side is that customers who have had a positive experience can be thanked for their feedback, which encourages customer loyalty. The next step in acting on the qualitative feedback is to reduce it into quantifiable themes through the process of coding, where comments are grouped by theme. For instance, 18% of comments may have referred to “slow service” and 14% to “lack of job knowledge”. Now, we can monitor the frequency of various themes by business unit and over time. Comment tools are not new, but with modern technology can be employed as a valuable feedback tool to identify at risk customers and mitigate the causes of their dissatisfaction. Finally, the unsolicited nature of customer comments offer a unique opportunity to feed themes identified in customer comments back into customer survey design, allowing managers to determine if issues uncovered are broadly present across all customers.